This is the most incredible collection of software that I’ve ever had the pleasure of seeing. Even though I’ve yet to complete all the downloads necessary to deploy it, i’ll be spending the next few weeks trying to make sense of all of the code so that I could modify it to fit my needs. Thank you for all of the hard work you put into this, and I really hope that i’ll be able to decipher it all! just wanted to express my sincere gratitude for your work. this kit and its predecessors have intrigued, challenged, confounded, educated, inspired, and enlightened me greatly over the last several years. this work, along with that of johan’s and niehaus have rewritten the playbooks for IT Consulting Practices on a global level. The effort and cost required for initial infrastructure builds has limited long term benefit for the end customer. through the use of your kits, scripts, and the concepts they entail, we’re now able to focus our efforts on operation and maintenance of the environments we’re building, much to the delight of clients who must assume the reigns when our work is done. Great work … Looking forward on the Windows Server 2012 R2 and System Center 2012 R2 update on this. Great Work … Looking forward on the Windows Server 2012 R2 and the System Center 2012 R2 update on this. I am getting an error from the download link as well. If I just click on it, I get page cannot be displayed. If I open it in a new tab, it takes me to sky-drive. Yay Internet Explorer. Looks like the Windows 7 evaluation has been removed from the TechNet Evaluation site. Any ideas where I can download this? The link for Windows 7 redirects to the Windows 8 evaluation. I managed to find the Windows 7 Eval link, but the SharePoint 2010 Foundation is definitely not out there anymore. can someone please tell me how to join the servers to a existing Active Directory domain?. When I click on the link for downloading the hydration kit – http://sdrv.ms/YJNHJn , it says “The website declined to show this webpage” . 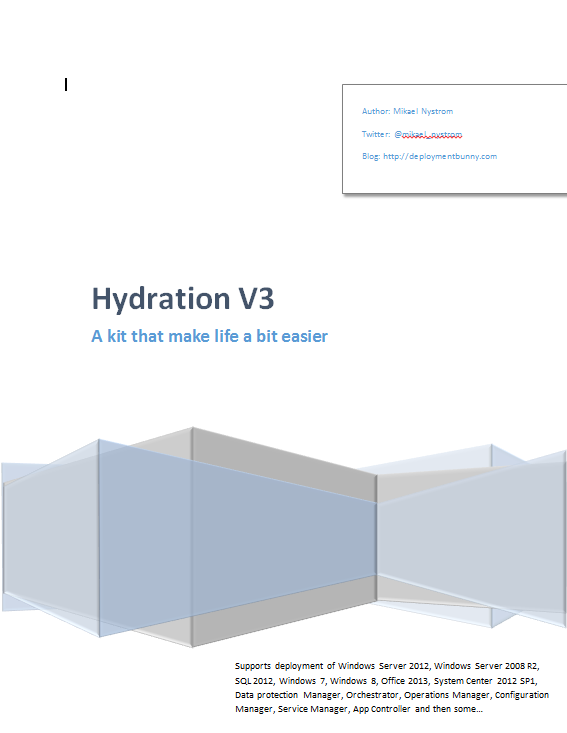 I googled this page – http://deploymentresearch.com/Research/Post/407/The-Hydration-Kit-for-System-Center-2012-R2-is-available-for-download . It talks about – The Hydration Kit for System Center 2012 R2 is available for download – I am a real newbie, so I am not sure what “system Center” implies. I am just trying to use the hydration to build labs to study for – Mcsa Windows Server 2012 . Does this sound like it would be the right hydration kit for me?